High-speed, extremely flexible beamforming provides images with superior resolution at higher frame rates. Tissue Specific Optimization corrects for differences in the acoustic characteristics of tissues in the human body to improve lateral resolution. Parameter sets optimized for the patient's body size and examination objective can be selected with a single keystroke. The switches on the operating panel and touchscreen can be customized. Elastography provides images showing the elasticity of tissues in real time. 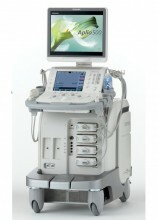 Smart Fusion displays volume data acquired by another modality in synchronization with the ultrasound image. 2D Wall Motion Tracking enables cardiac wall motion analysis. High-resolution 3D/4D images can be acquired. Fly Thru shows the luminal walls. Click the button below to add the Toshiba Aplio 500 Multipurpose Ultrasound to your wish list.